The New Discovery TGA 5500, TGA 550, and TGA 55 feature a progressive system design resulting in unprecedented performance in sensitivity, temperature control, atmosphere control, and baseline drift. At the core of every new Discovery TGA is the exclusive TA proprietary Tru-MassTM balance system, which delivers the highest sensitivity and most accurate real time weight data in the industry. A new app-style user interface is standard with each model, providing effortless control and monitoring of TGA experiments. 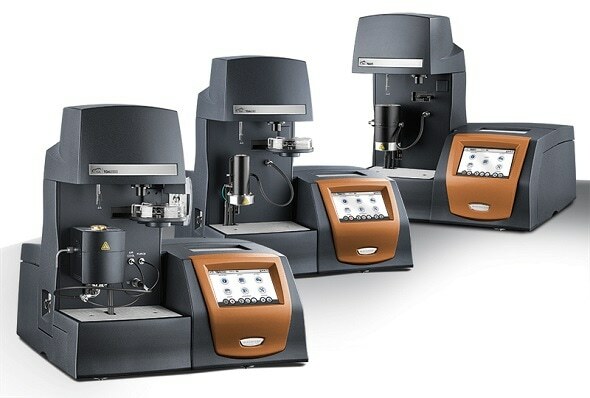 Combined with powerful new TRIOS software, automated calibration and verification routines work seamlessly to dramatically improve laboratory workflows and productivity. The result is a comprehensive line of TGA systems that deliver the most accuracy, highest sensitivity, and greatest reliability. Ultra-low drift. The Discovery TGA delivers optimum performance without requiring baseline subtractions and other post-test manipulation. The result is an innovative new TGA with unrivaled performance in weight drift and sensitivity. The patented IR-Furnace of the Discovery TGA 5500 is able to control over a wide range of linear rates, while maintaining quantitative accuracy in weight loss. It delivers unmatched control and stability in ballistic, controlled-heating, and isothermal experiments. An integrated electromagnet automates verification and calibration using Curie point standards, minimizing operator time dedicated to routine operations. High-performing wire wound and optional Evolved Gas Analysis (EGA) furnaces for the TGA 550 and TGA 55 ensure there is a TGA furnace with industry leading performance to meet your needs. All TA furnaces are covered by the industry’s only 5-year warranty. All Discovery TGA’s are designed with superior atmosphere control to meet the most demanding applications. The innovative Gas-Delivery manifold design eliminates potential leak points from tubing and hardware connections, ensuring the most consistent and repeatable atmosphere. Software-controlled gas switching is integrated for experiments requiring dynamic or reactive atmospheres. The new gas blending module provides additional flexibility of 4 gas inputs with controlled switching and blending capability. Optional sealed pans are available to maintain the atmosphere of the sample until the experiment starts. Whether maintaining an inert atmosphere, switching to an oxidative purge, or maintaining a high vacuum, the Discovery TGA is up to the task. In Hi-ResTM TGA, a method pioneered by TA, the heating rate is controlled by the decomposition rate of the sample. Benefits of this include separation of broad and overlapping weight losses, increased productivity with better resolution, rapid survey over wide temperature range with excellent resolution, and simple method set up. Patented MTGATM is another TA Instruments innovation that offers advantages for material decomposition studies. With MTGA, activation energy can be calculated real-time and studied as a function of time, temperature, and conversion. The benefits of MTGA include increased productivity for studying kinetics, model-free kinetic data, and direct measurement of activation energy. It can also be combined with Hi-Res TGA for better separation of overlapping weight losses.